Today is International Women's Day. Worldwatch Institute is recognizing it by celebrating the power of women to nourish the planet. I learned some interesting facts from reading their article. Worldwide roughly 1.6 billion women rely on farming for their livelihoods, and female farmers produce more than half of the world’s food. In sub-Saharan Africa alone, women account for 75 percent of all the agricultural producers. The information in the paragraph above astounds me. It should probably more accurately read..."Worldwide, outside the U.S., roughly, 1.6 billion women, etc”. Here in the U.S. we have the most technologically advanced commercial agriculture system on the planet. Women do not have to be farmers to sustain our society. That is obviously not true in much of the world. The good news is that women worldwide are developing and utilizing agricultural innovations to sustainably nourish their families and communities. 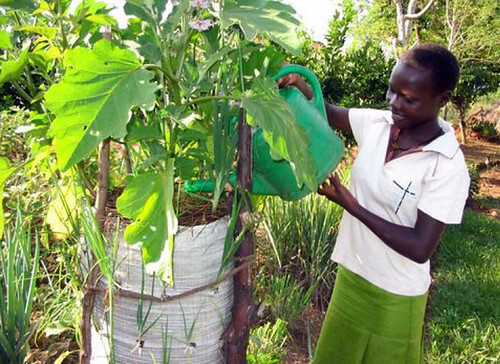 The fact that women worldwide are using agricultural innovations is not news to me. I have blogged about it before. It is probably unbelievable for most Americans to understand that there are international charitable organizations teaching methods like simplified hydroponics, sack gardening and keyhole gardening to people in emerging economies that our own educational institutions ignore. Whose fault is this? As usual, the fault lies with us all. As usual, there are no “they”. Quote Pogo, "We have met the enemy and they are us”. The big question is why we as consumers (and taxpayers) tolerate the retrogressive consumer horticultural education that is so embedded in our society. It starts at the land grant aggie schools, works its way through their USDA partnered Extension Programs and Master Gardener programs and ends up in our local botanic gardens, staffed largely by independent contractor "educators" who preach the gospel of dirt and drain holes. That is all they know. Based on professional experience and research over the past four decades it is my belief that we have the lowest ranking consumer horticulture education in the industrialized world. Shame on us! It might be a good idea for us to import some teachers, women in particular, from Africa and South America where they are learning new methods of growing local food. Many of these women are earning more than their husbands. How shocking! Using simplified hydroponics as taught by the UN FAO and others, she probably knows more about hydroponics than the majority of American gardeners. 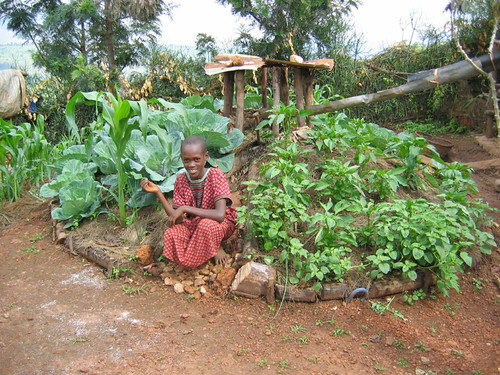 Growing her food in a keyhole garden, as taught by Send a Cow (UK), Soladarities (France) and others, she probably gets more produce per square foot (while saving water) than the majority of American gardeners. Growing her food in a vertical sack garden, as taught by Send a Cow (UK), Soladarities (France) and others, she probably gets more produce per square foot (while saving water) than the majority of American gardeners. Find out what these Spider plants are growing in after the jump. Recycling goes beyond just soda bottle sub-irrigated planters (SIPs).